Hard sleepers, “硬卧” in Chinese, are the lowest-class and cheapest sleepers on China trains. They are available on Z, T, K, L and other normal speed trains. China high speed trains do not have such kind of sleeper berths. Hard sleepers on China trains are popular among budget travelers for long-distance overnight trips. A hard sleeper China train carriage usually consists of 11 semi-open compartments, so it is noisy but can be a good opportunity to know some common Chinese people. Each compartment has six berths, three in each side. The berth is not big, only 24 inches (60cm) wide and 71 inches (180cm) long. Basic beddings, such as a quilt, a pillow, and a sheet are provided. A ladder at the end of the beds is for passengers to go up and down. Passengers on the middle and upper berth can hardly sit up straight, as the head spaces for the middle and upper berths are only 28 inches (70cm) and 26 inches (65cm) respectively, hence the hard sleeper tickets of lower berth is higher than that of middle berth and upper berth. There is a hook by each bunk for passengers to hang their overcoat. A small table is between the two lower bunks. Each compartment also has a thermos, a dustbin and a tray for litter. A LCD TV is also available in each compartment on some trains. A small table and two foldable seats are in the aisle by the window; the luggage rack is above the seats and large enough to hold a 28 inch suitcase. Hard sleeper bunks are numbered as No.1 Top, No.1 Middle, and No.1 Bottom. Bunks No.1, 2, 21, and 22 are at the two ends of the carriage, thus close to the toilet, hot water heater, and the smoking area, so it will be a little smelly and noisy during trip. The toilet is a squat type and at one end of the carriage without toilet paper. A red sign on the door means it is occupied and a green sign means it is available. A water heater at the end of the carriage works during the trip and provides free drinkable hot water for passengers. Use it when the green light on. Washbasins and a mirror are usually near the toilet, but you need to take your own towel and tooth brush. A large dustbin is available here for passengers to throw large rubbish, like instant noodle bowls. Smokers can go to the connecting area where there is an ashtray. Only passengers holding a hard sleeper train ticket can get in the carriage, so the carriage will not be overcrowded. 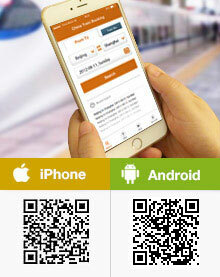 After the train starts, a conductor will collect passengers’ paper tickets and give them a sleeper exchange card. The conductor will give the tickets back before passengers reach their destination. At night, the lights in hard sleeper carriages will be turn off around 22:30 and only the small wall lamps remain on. Passengers will have a good sleep. The hard sleeper ticket price is about twice that of a hard seat. Many foreign backpackers and budget travelers choose it because of the reasonable price and comfortableness. Top, middle, and bottom bunks are differently priced: the middle bunk is about CNY10 cheaper than the top bunk, and the bottom bunk is CNY10 cheaper than middle. The experiences are also quite different. A bottom bunk serves as a public couch, as other passengers in the same compartment usually sit on it in day time. After you go to sleep, you can still hear people move back and forth in the aisle. But though there is good head room. The middle bunk is moderate. You have to climb up and down but you have a relative private bed. The head room is less than the bottom, but it is fine to sit on your bed a little bent over. The top bunk is actually not very easy to climb to, so it is not recommended to those who are not fit enough. You enjoy the privacy but lose some head room. The good thing is it is easy to get your bags on the luggage rack. Note: On international trains to/ from China, the hard sleeper carriages may be different. 1. Foreign passengers are usually ‘attractive’ on a Chinese train. Other passengers may come to talk to you and take photos with you. Most of them are friendly and warm-hearted. You will have a good time if you like to talk to them. 2. If you prefer to have a good rest during your trip, just show an I-don’t-want-to-talk face, or just keep reading. 3. Pack a small bag with the things you are going to use on the train, such as a towel, a tooth brush, a comb, toilet paper, magazine or news paper, instant noodles, water, and other snacks. Leave the small bag with you on your bunk and put your large luggage on the rack or under the bottom bunk. Both hard sleeper and soft sleeper are recommended when traveling by overnight trains. Hard sleeper costing less is welcomed among budget travelers. But the compartment may be noisy without a door. However, passengers have a chance to chat with each other and learn about the locals' life style. There are six beerths inside each compartment. In contrast, soft sleeper compartment with 4 berths and a door provides passengers a better traveling experience, a quiet environment and more privacy. Hey how do i get the top bunk when I buy the hard sleeper ticket? Some times it is a ladder, some times is it like a pedal on cabin wall. how much hard sleeper going from hong kong te beijing? CNY505 per person for normal days. There only 2 options fot the train sleepers hard and deluxe. Deluxe has 2 berths and door. And hard has 4 berths and closing door for 4 people compartment, or its the one without door open completely? Is there any showers in the train ? The hard sleeper for this trip is also 4 berths with closing door. No shower can be find in any class. Are passengers provided with bedsheets, pillows and blankets in hard sleeper? Is their cost included in the ticket? Yes, bedssheets, pillows and blankets are provided on the hard sleeper cars, no extra costs. I will be traveling from Kunming to Lijiang by night train in next week, and I'm planning to buy them on the day I travel. Are the trains very full that I won't get sleepers? Thanks. Soft sleeper for some of the trains would be sold out on the travel date, it is hard to say.